Blogger of the Month (BoM) is here for the first time ever in the world of Design Team anticipating. This is a new concept of DT blogging where the blogger is in total control, gain with no obligations. It is totally different than any traditional Design Team calls ever. Craft bloggers are the manufacturers' soldiers of the net! In real life, bloggers are people who spend time and energy to make lots of beautiful creations, tutorials, great photography, great videos and generate a very sweet communication patterns that makes us love them. They deserve recognition. In return of the many favours I have created the BoM concept. It is great for small businesses and useful for growing bloggers to spot lights on, reach new readers and get appreciated. Each month, a chosen blogger will tell us about herself. The blogger will choose what she wants to share with us on SHC website and social media. Connect with more people. My name is Suha and I am the owner of SHC, creator and manager. It is a little online shop for crafting items designed in Sweden mostly. In fact all dies and stamps in the shop are Swedish manufactured. The shop has started to grow recently. Things happen quickly and I am getting very busy. I noticed hands growing out of my sides, using them to do everything myself. I am also planning online short classes to take place during 2017. I have lots of plans and activities in the future. This means I will need lots of people to get involved! Lucky me you all out there are my saviours! My perspective is, having an online shop is one thing and being part of an online society it another. Being thankful to all customers and bloggers is essential to me. I do not exist without you. Therefore I am reaching out fellow bloggers in the crafting industry to apply for the BoM or share the word and encourage great bloggers who you think they deserve a spotlight to apply. You are not necessarily a well-known blogger. That's the point of BoM, step in the light. If you are chosen, for a whole month, you'll have your biography and photo published on your dedicated page on Swedish House Crafts website. You will also have your blog completely embedded into that page and 100% functional. This means that visitors will be able to explore and read your blogposts with all it's functions, affiliates and all links you have on your blog. Your blog, name and links will be shared on SHC social media and blog. Get exposed to more people and gain more followers. Your blog is in English. Preferably, your readers are mostly from UK and/or EU but not essential. Your style is not necessarily like SHC, but in the same line. This is difficult to determine as everyone's reception of creativity is different. However, variety and diverse is one of my favourite subjects! An active crafting blogger, for papercrafts mainly and more if you like. .
You use or have used Scandinavian products (along with other manufacturers), whether it is from Sweden, Norway or other surrounding countries and you mention in your blog the manufacturers' names. That's it, if you have the above criteria, you are eligible to apply. You post one little/short blogpost about anything related to SHC, it can be blogging about yourself being chosen to be on BoM. You add a very little linked banner of SHC in your blog during the featured month. What is it for you (in return)? 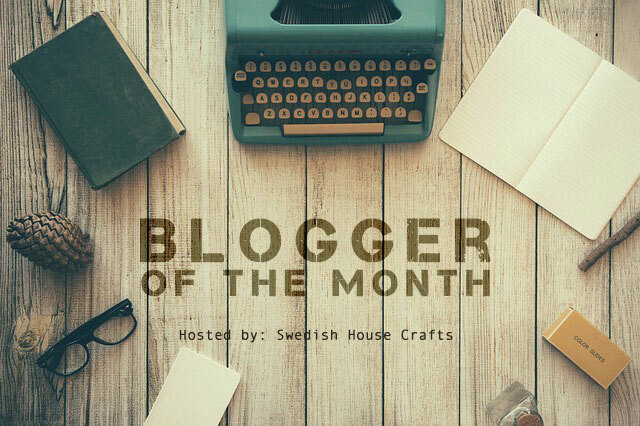 You receive a badge Blogger of the Month to add on your blog if you wish. SHC offers a generous 25% discount on all your purchases valid from the first featured day and valid 3 months after the featured month is ended (4 months in total). You can share this 25% discount with 2 friends of yours (in prior arrangement). You may also receive free item(s) each time you make a purchase. Valid only to your own purchase shipping address and during the featured month only. Your total control over the content featured as long as it is about you. Optional: Opportunity to gain extra money. If you wish and approve, you will be provided with a discount code to publish on your blog for your readers. This code is an identifier of you. Every customer uses this code will get 10% discount. Each complete purchase gives you 5% in return. The code will be valid 1 month, during the featured month of course. This is manually processed and you will be notified and paid during 14 days after the featured month is over. You will be provided evidence or usage. Applying is made by filling an online form linked down here. Deadline is 23 December 2016. The chosen bloggers will be announced on 29 December 2016. First Blogger to be chosen will be featured from 10 January to 10 February 2017 and so on. The BoM first season will be running for 6 months. This means I will be choosing 6 great bloggers this time and it absolutely never means that others are less. I will NOT keep record of the bloggers information after the announcement of BoMs is made on 29 December 2016. So things should be fairly done. I will be choosing purely on a design checklist prepared earlier. You can trust my choice because I am first of all a master designer in the visual field and I know what I am doing. The checklist is private. By submitting your application you accept all above mentioned. All applicants receive £5 voucher after the application is submitted. Open to everyone in the world that fulfils the above mentioned criteria.